Some people like to go shopping the day after Thanksgiving, and here at the Daily Turismo, we agree! But don't waste your time waiting in line at Best Buy for some piece of electronic gadgetry that will be obsolete in a week -- instead, we suggest blowing your hard-earned cash on a piece of automotive art, maybe a classic designed by Paul Bracq? But first, help us find the best cars for this year's celebration of Bracq Friday. Send in your best Bracq Friday tips via email to tips@dailyturismo.com or drop them in the comments below. 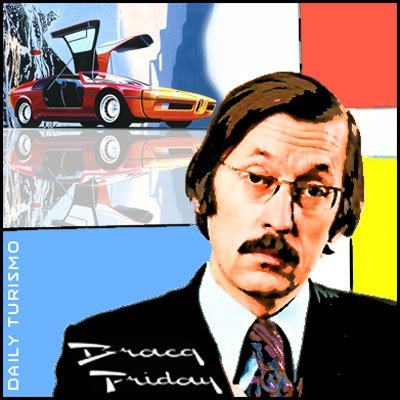 Big thanks to DT's in house graphic artist and Sous-Chef de Cuisine Kaibeezy for the awesome Bracq Friday art. Ok, I'll go first. I submit this semi-needy but still presentable W108 280SE 4.5. $6k - body and paint look good, nice classy red interior - but I loathe those cheesy "MBZ" floormats. They should be burned immediately because they bring a Pep Boys vibe to an otherwise Guggenheim interior. Did Bracq do the R107? I thought just the Pagoda SL. Oh, right, well, maybe not, but surely inspired it. This W114 Coupe for 7.5K. Claimed one owner, matching numbers car with full service history. Everything works. Too bad the color wasn't something more 70's Mercedes.